We’d love your help. 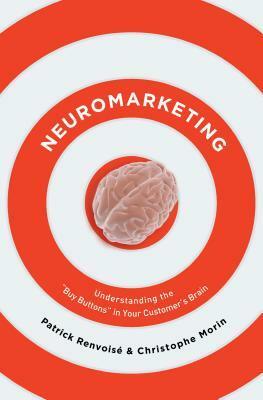 Let us know what’s wrong with this preview of Neuromarketing by Patrick Renvoise. Because paople are inundated daily by an average of 10,000 sales messages, selling is now tougher than ever. That's why you need to learn what neuroscience has uncovered that will immediately increase your selling and influencing effectiveness. Unveiling the latest brain research and revolutionary marketing practice How can the latest brain research help increase your sales? The 6 message building blocks to address the "old brain"
To ask other readers questions about Neuromarketing, please sign up. I have mixed feelings about this. There's some interesting psychology that explains the sales and marketing process, but it's not especially detailed. Also the examples are variable - some I really bought into and will definitely try to replicate, others felt very tenuous. I recommend reading The Power of Persuasion and A Mind of its Own for a more detailed look at the psychology. I've used the principles in Trust-Based Selling for years, and Neuromarketing supports and enhances this. It's also r I have mixed feelings about this. There's some interesting psychology that explains the sales and marketing process, but it's not especially detailed. Also the examples are variable - some I really bought into and will definitely try to replicate, others felt very tenuous. I recommend reading The Power of Persuasion and A Mind of its Own for a more detailed look at the psychology. I've used the principles in Trust-Based Selling for years, and Neuromarketing supports and enhances this. It's also really worth looking into the "layers of resistance" described (if not by that name) in It's Not Luck. Overall, worth a read if you are involved in sales and marketing - time will tell as I experiment with the ideas which work best. Not a must-read if marketing isn't a primary concern to you. Reads too much like a salesman manual. I'm not the target audience for this but salespeople might benefit from the technical tips given here. The underlying concept and advice given were plausible, coherent and applicable to many aspects of life even outside of marketing, it's just that the way they're presented here didn't gel with me. I'd probably look out for books written on similar subjects but with a different slant to it. 2. Four steps to influence decision maker - the old brain. Doing this in a correct way can increase your website’s conversion a lot, which can mean the success of your product. This book explains how the brain works, and how to convince your customers “to click the buy button”. The conclusion of the book is: marketing is dead, neuromarketing is everything. And I think the writer is right. The book is easy and interesting to read, and the theory is well supported with pictures (of ads). I attended a marketing course at my university but this book is much better than that course! People don’t behave completely rationally, so it’s not rational argument that will win you the sale. Rather, you have to appeal to people’s ancient decision-maker, the old brain. By knowing how to communicate with the old brain, you’ll be that much closer to closing the deal. One of the best book i read. A good introduction to Neuromarketing. Great book for those who are just starting to explore Neuromarketing subject/works in sales or marketing departments but not groundbreaking for those who wants to have deeper knowledge. 2 предложения по нейромаркетингу, а далее какое-то пособие для продажника. I won't say that this book is revolutionary, but it was great. The more "advanced" you get in a discipline, the less effective you tend to become. Thinking about marketing in an 80/20 sense, the 20% you NEED to know in marketing to give you 80% of your expertise is in this book. You can build on it by studying copywriting, persuasion, and so on - but I found this to be a good summary of different areas. The greatest benefit I found from this book is the concept of positioning benefits in one of th I won't say that this book is revolutionary, but it was great. You can build on it by studying copywriting, persuasion, and so on - but I found this to be a good summary of different areas. The greatest benefit I found from this book is the concept of positioning benefits in one of three ways: Financial, Strategic, and Personal. It's helped simplify and improve my brainstorming of benefits. And I don't find academic neuromarketing and consumer neuroscience to be very helpful for marketers. All you should worry about is the fact that there is three brains in each human, and each has a certain set of concerns and functions. It doesn't matter if you can name the different areas. Who cares if you know where in your brain the medial prefrontal cortex vs lateral prefrontal cortex is. What does matter is, do you know how to communicate to each of the brains? A book for salespeople. I am not a salesperson, so I was always aware of the rah, rah, of the sensation of being both the hunter and the hunted. Nevertheless, the book is clearly and concisely written and applies many of the principals it propounds. The main thesis is that presenters should aim at the "old brain," the primitive fight-or-flight, what's-in-it-for me lizard brain. I found that idea valid and believe I can apply the principals based on it to the presentations that I have to give, so I A book for salespeople. I am not a salesperson, so I was always aware of the rah, rah, of the sensation of being both the hunter and the hunted. Don't read this expecting any in depth study in the correlation between neuroscience and marketing. This is a primer for basic advice for salesmen couched with a few very basic terms in neuroscience. This new field is exploding and I am sure that there is or will be good books written on the subject. Aside form the great cover there is little to recumbent. My first clue should have been when I looked at the list of his sources. Be warned, skip this book! Хорошая попытка систематизировать текущие представления о маркетинге, основанные на изучении мозга. Помогает лучше понять механику принятия решения о покупке, однако революционных идей обнаружено не было. Рекомендую к прочтению как новичку в теме, как с точки зрения покупателя, так и увеличения своих продаж автор дает конкретный алгоритм реальных шагов. This book was ok. I really like learning about the old "reptilian brain". The one thing I really took from this was how images have a huge effect on first impression. This is helpful if you're in internet marketing and care about conversion rate optimization. Check out www.conversionxl.com/blog for a really detailed explanation of that (not my blog, just a really helpful site). These two marketers take some of the recent findings about the way our minds work and apply them to marketing. The result is a breezy, quick read that looks sometimes like the old marketing -- "make it about the customer, not about you"-- but does contain a number of interesting insights and useful tips for anyone trying to be persuasive and memorable. Seeing the author present this in a seminar setting had an important impact on my career, but this book is fairly lightweight on the actual topic of neuromarketing. Primarily a book on how to be a more effective salesman, and probably a good one at that. But, for students of applied consumer neuroscience, there are plenty of good alternatives. The book is interesting and gave me lots to think about. However, I found myself questioning their studies. I'm sure the authors are not making up the content, but I'd rather read about specific studies that the authors then unpack the insights on. An interesting and short book about the finer points of effective marketing. Loved the book and the science behind it. I have also see Patrick speak twice and the advice is very helpful. Interesting look into how the brain makes decisions -- will cause you to think about your approach to sales and presentations. Vodič kako se oduprijeti konzumerizmu ili obrnuto, kako uspješno prodati proizvod/uslugu. When you learn a great deal about yourself, you've read a good book. Takes you deep into your brain..deep. I really found this useful, and I'm typically not a fan of "how to" business books.